This is a video synchronize system for Exhibition. It could synchronize the video playback procedure for several computers, so you could combine several screens to make a special visual effects. Use the synchronize signals when playing back the video, so the video could always be synchronized. No limitation to the number of computers to control. You only need to connect all computer in to the LAN. Supports all standard video formats. The software will use the video codecs on your system automatically. The new player could be appended anytime with just connecting it in to the network and doing some settings on the control pc. Supports auto loop play to display the video continuously all day long. Supports remote controlling of the video display by hardware device. Display videos at the same time Open the video files and display them with network or hardware signal. Turn on the players through the switch. The server will send the video signal to all players, but for the buffer of RTP/RTCP protocol, the start time of all players can't be synchronized. Open the video files and display them with network signal. Synchronize during display There is no synchronize signal controlling the video during displaying. Nowadays, all operation systems are non-real time, the tasks in system are executed alternately with time fragment method. So although the hardware configuration are similar with each computers, they will still have some errors with the process of the displaying and the error will become obvious gradually. Although there isn't any synchronize signal to control the video during the process, the effect of synchronization is still well when using the real-time embedded system and decode with hardware. All players' video are controlled by media server, but the synchronous effect is not very well. The "Controller" sent the synchronous signal in the whole display process, each player active adjusted the display speed to ensure good synchronization. Auto loop display Support, but the interval is imprecise. Support. Support. Support. Display same video Support. Support. Support. Support. 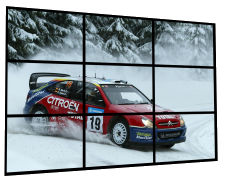 Display different video(multi-screen) Support. Support. The media server should broadcast to several video channels, so the synchronization is very poor and the channel number is limited. Support. Support video format Support all general formats. Only support some old formats, like AVI, MPEG and so on. Depend on the media server. Support all general formats. Display high definition video Support. Generally, it does not support because of the influence of hardware. Generally, it does not support because of the influence of the media server performance. Support. Output 5.1 channel audio Support. Not support. Not support. Support. Cost Low. Change the hardware is expensive. The media server is expensive. Low.